Equity markets have once again turned down this morning after yesterday’s rebound. For global stock market investors, the news in 2016 has been marked by negative returns and we think it’s important to address the topic of the recent volatility. 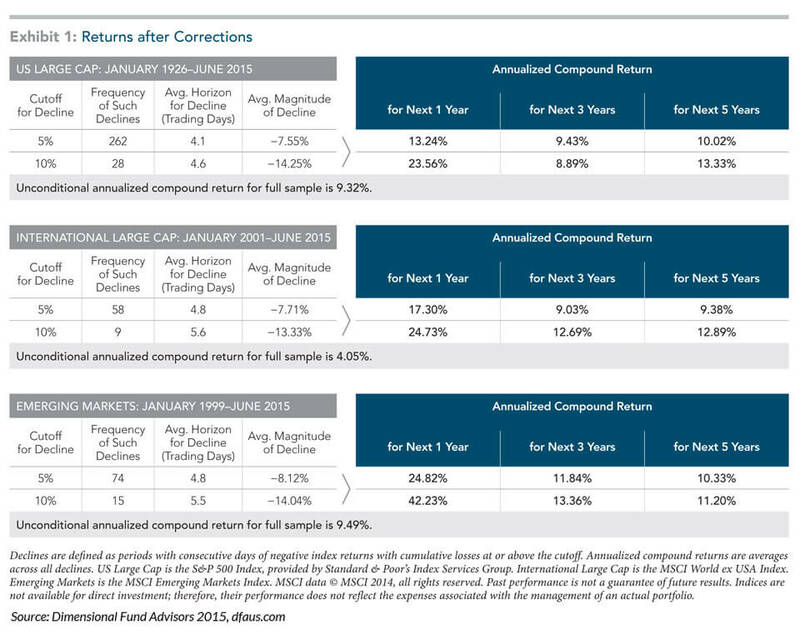 As most successful investors realize, negative stock market returns are to be expected from time to time—as often as three years out of every ten. For the US stock market, as measured by the price of the S&P 500, 2015 was the first negative year since 2008. Market pullbacks are an ordinary part of investing in riskier assets associated with the higher expected returns that investors need to build wealth over their lifetimes. The latest downturn is being attributed to the negative news out of China and it’s having a rippling effect through the world markets. However, we are mindful that these kinds of events are nothing new and have happened with regularity throughout market history. As an example of how “normal” these kinds of declines are, the following chart illustrates that the US stock market alone has had 262 declines of 5% or more since 1926, and an average of more than three per year. Note that the average number of trading days to create the decline was less than five. Because of this unpredictability, wise investors prepare by holding well-diversified portfolios appropriate to their current and future growth and liquidity requirements. An investor’s growth and liquidity requirements, along with an understanding of their general tolerance for risk, is best discovered through a comprehensive planning process. This is true for both individuals and institutions. It’s never easy to easy to go through these turbulent markets. Remember that the important work of preparation was done prior to the current environment through planning, preparation and engaging in a portfolio strategy based on robust academic research, as well as real world experience. At Resource Consulting Group we will continue to consistently apply these and other developing principles to your unique situations and be here to meet with you to discuss and adjust the comprehensive range of financial planning considerations and related portfolio strategies that lead to your success.